Submitted photo This photo of Mike DeWine and George Voinovich in Xenia ran in the Gazette in October of 1990. Today I am headed up to Huron County and then up to Port Clinton to do some campaigning and of course when I think of Port Clinton and Lake Erie, I think of fish! Last year we took our entire family to this area to celebrate our anniversary and we had a wonderful time. Some of us fished, and some of us (like me), just played with our little ones on the beach. Lake Erie is such a great asset to our state. Our sons Pat and John volunteered to cook the fish. Pat fried the perch, and John grilled the walleye. It was fresh and delicious and we brought some home, too. Today I thought I would share a couple of my recipes from our new cookbook. The first one is a recipe Janet Voinovich gave me years ago for George Voinovich’s Pan-Fried Walleye. And when I think of George Voinovich and Xenia, I think of the great event we had in Xenia right before his election for governor. Mike and George rode into Xenia on North Detroit Street in a wagon pulled by Woody DeHaven’s beautiful team of work horses. George was at the reins (though Woody never entirely let go!). Hundreds were assembled on the west entrance of the courthouse, which was beautifully decorated with a mural, painted by Steve Hale, of the rising sun, depicted in the Great Seal of the State of Ohio. The painting fit right in the arch above the double doors. I saved this painting and now it hangs in our campaign headquarters. To go along with the pan-fried walleye, I have also included another recipe from our new cookbook from Jon Husted. Jon, too, loves to fish in Lake Erie with his father, and this recipe for fried potatoes is one he always cooks to go with his fried walleye. If you want one of the new cookbooks that Tina Husted and I made together, they will be available free at the Greene County Fair. Combine flour, salt and pepper; dredge fish to thoroughly coat. Heat butter and oil until sizzling; saute fish three minutes. Turn fillets. Top with capers; cook 2-3 minutes longer, until firm. Remove from heat. Squeeze lemon to taste over each fillet. Place all ingredients in a cast iron pan on open fire or cooktop. Cook on medium to medium-high heat, flipping potatoes on occasion. Cook until potatoes are soft, about 30-40 minutes. 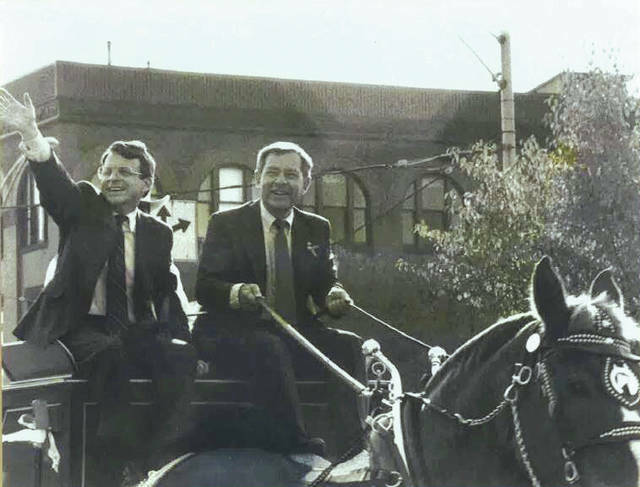 https://www.fairborndailyherald.com/wp-content/uploads/sites/50/2018/07/web1_VoinovichXenia.jpgSubmitted photo This photo of Mike DeWine and George Voinovich in Xenia ran in the Gazette in October of 1990. 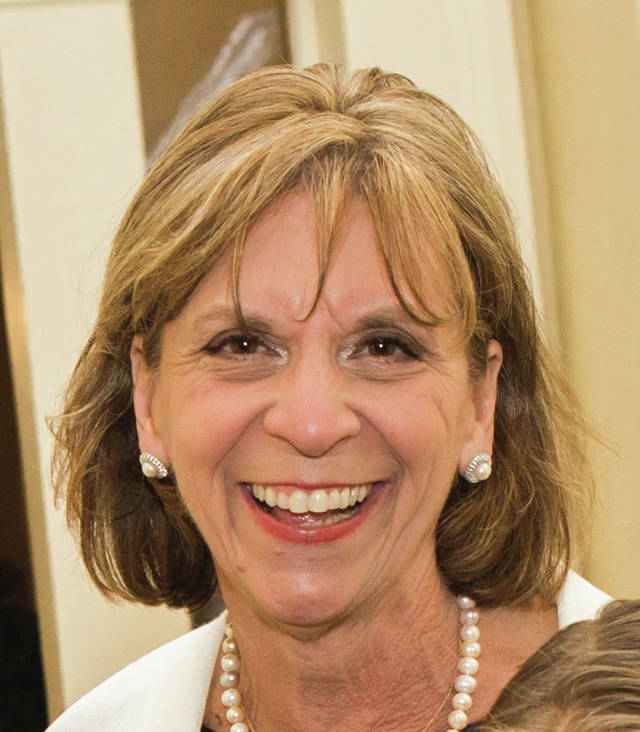 Fran DeWine is a Cedarville resident, wife of Ohio Attorney General Mike DeWine and guest columnist.